The Month in Theydon (December): Trevor Roberts latest report is on line Click Here. Parish Council Minutes: The minutes for the meeting of the 25th January 2007 are now available. Click Here. March 2007 Village News: The latest quaterly PDF version of Issue 57 of Village News is now available on line. Click Here. New Police Surgeries in Theydon Bois Village Hall: I would like to introduce myself as the new PCSO of Theydon Bois and Abridge. My name is Lorraine Oxley and I would like to hear from anyone who has any concerns or problems in the area. I will be running a surgery at Theydon Bois Village Hall every 2nd Wednesday of each month, starting from 10th January 2007 between the hours of 10am to 12 Noon. If you have anything to discuss or you would just like to pop along for a chat it would nice to meet you. Theydon Bois Drama Society's Latest Production: starts this week and will be 'Season's Greetings' - a comedy by Alan Ayckbourne. Dates are Thurs 11th - Sat 13th January 2007, at Theydon Bois Village Hall, Coppice Row, Theydon Bois. "Relatives and friends meet up to celebrate Christmas. Petty and not so petty squabbles break out with hilarious consequences, though some disastrous!." Performances start at 8.00 pm, tickets are £6.50. Box office is as always - Mr and Mrs James - 01992 812250. Parish Council Minutes: The minutes for the meeting of the 30th November 2006 are now available. Click Here. Theydon Parents Group: The Theydon Parents Group is an information service and was created to allow parents, grandparents are carers to communicate with each other on issues affecting children, young people and parents in our village. They issue a monthly newsletter which members are encoured to contribute to. They will soon be contributing a Web Page to the Village Web Site, but at present have a Web Page here where links can be found to their latest Newsletter. This may seem early, but 1100plus letters about the event will go to Davenant parents in January. Large numbers of tickets will be sold long before the event, so if you want to ensure you get tickets book now for Saturday, 7th July 2007 when there will be an opportunity for you to enjoy performances by Davenant School Bands, Choirs, Orchestra, Dancers and Drama students – some five hours of entertainment – whilst you picnic in the impressive grounds of Copped Hall, near Epping. This is also a pre-tour music event before a party of 200 depart to the Italian Lakes for a series of concerts a week later. Please bring your own food, drink, tables, chairs, candles and even candelabras – dress can be casual or black tie; it is entirely up to you! Table parties can be of any number. Tickets are £15 each or a family ticket for 4 is £50. Tickets will be available from January, from John Powell (Head of Performing Arts) at the school, Chester Road, Loughton, Essex IG10 2LD. Tel 020 8508 0404; Fax 020 8508 9301; e-mail reception@davenant.com. A form can be downloaded from the School website at www.davenant.essex.sch.uk from January. Cheques should be made payable to DFS Arts fund please. New Theydon Bois Primary School Web Site Now Open: It has taken much longer than we had hoped for but thanks to the hard work of Adrian McCarthy with help from staff, pupils and the school PTA, together with the Village Web Site Team the site is now up and running. It resides on the Village Web Site Server and is in effect a sub-site of the Village one, but will act independently having Adrian as Editor. The server costs of the Village Web Site are met by the Parish Council and all work on the web site is done on a voluntary basis. Views expressed on both sites are not necessarily those of the Parish Council. The new site can be accessed at anytime from the Home Page of the Village site at www.theydon.org and then by clicking on primary school in the menu or you could add its home page to your favourites list for quick access. The site will give visitors access to a wide range of information and will include lots of photographs of the school and of the children’s work. Current news and all the important dates will be available as well as a history section and the opportunity to download information letters sent out by the school. 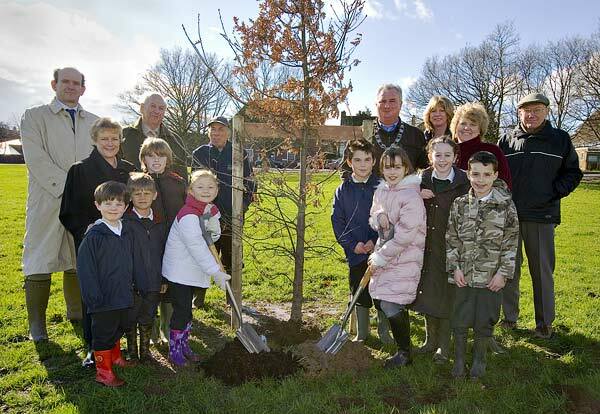 Planting the tree to celebrate the 50th anniversary of the new school building in Orchard Drive. 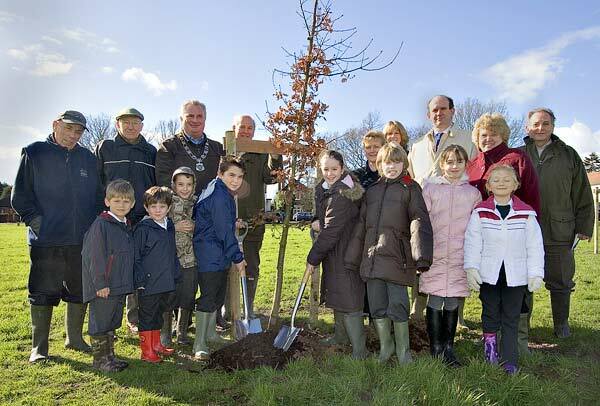 On 21st February eight school children, accompanied by Sue Jones and Headteacher Mrs Bonds, assisted with the planting of two new trees on Theydon Bois Village Green. The first, to the left of the Trafalgar Day tree, is to celebrate the 50th anniversary of the new school building in Orchard Drive. The other, to the right, is to celebrate the Queen’s 80th Birthday. It is interesting to note that the other 3 copses on the main Green were planted after the end of the Second World War by children of the original school situated in Coppice Row. Also in attendance were the Superintendent of the City of London, Mat Roberts, Parish Council Chairman, Robert Glozier. Cllrs John Padfield and John Eaton, Parish Clerk Madeleine Murphy and members of the Rural Preservation Society, Peter Newton, Trevor Roberts and Jim Watts. George Haley and his team from EFDC provided the trees and supervised the planting. 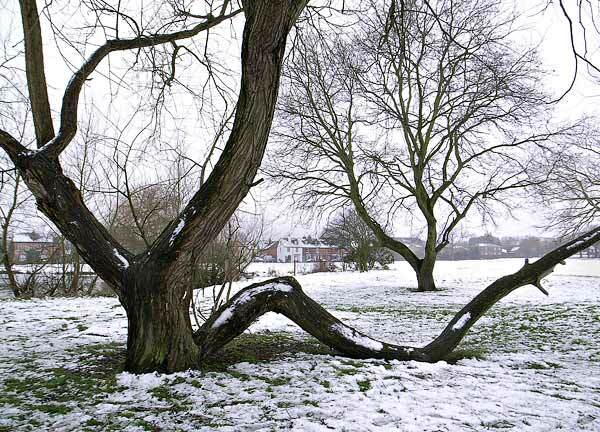 The trees were paid for by Theydon Bois Parish Council. Planting the tree to celebrate the Queen’s 80th Birthday. 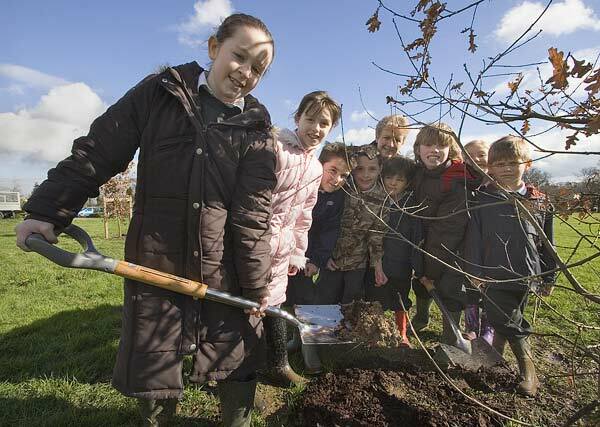 Theydon Bois Primary School Headmistress Elspeth Bonds with the Pupil Tree Planters. Theydon Bois WI ran their yearly Pancake Day special event in the Village Hall on Tuesday 20th February. Members and visitors enjoyed coffee and fresh pancakes and 27 pupils from the Primary School took part in a Pancake Tossing Competition as did members of both Theydon Bois and Buckhurst Hill WI.s. The idea was to see who could put on their costume and then toss the most pancakes in a fixed period of time. 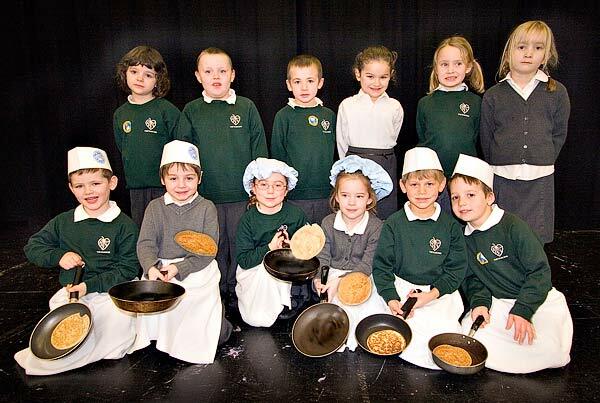 Our photo shows the 6 Primary School finalists in the front row with some of the other entrants from the school. 1st prize overall went to Jacob with 37 tosses, 2nd Emma with 27 and 3rd was David with 26. After there was a spring bonnet competition and the Talking Hands Group entertained with a signed performance of the song Easter Parade. Adrian McCarthy from the Village Web Site Team has been working hard together with the Primary School Staff and Pupils on developing the new Theydon Bois School website and it is now about to go live. The launch dated is scheduled for Friday 23rd February 2007. The 8th and 9th of February saw winter blow into Theydon causing disruption to the underground services and the roads, but it did make the village look even prettier. More pictures in our photo gallery here. As I am sitting writing this article, news has reached me of two burglaries in the Village, one in Woodland Way, and the other in Coppice Row. Both houses were broken into and entered from the rear. These occurrences cause great distress and inconvenience . May I remind you that on leaving your house, all means of entry are closed and secured, including side gates and rear entrances , not forgetting fanlights and garage doors. Keys should not be left on hall tables where they can be "fished for " through the letterbox..
A few years ago, upon reading the Insurance Policy for our house,it stated that the Insurance company would allow us a discount off of the policy on the understanding that our home was protected by locks to the Insurance company"s required standard. On enquiring what the required standard was, we were told that the final exit door should either have a mortice deadlock, having at least 5 levers, or a rim-cylinder deadlock, lockable with a key, from the inside. Similarly the back door should be lockable from the inside, with security bolts as required. Windows should also be secured by a key operated lock. It might be worth a phone call to your Insurance Company to ascertain that you have the required locks, not only on exit doors, but also on windows etc. From time to time , the Police notify me of incidents that happen in and around Theydon Bois , and I feel that if I were in possession of more peoples E-mail addresses, I should be able to pass on this information more quickly, and thereby help to prevent future crimes. This will enable those of us who have computers to inform those who have not. If you find this idea acceptable, please E-mail me on gra.car@btopenworld.com. I guarantee that the information that you give me will be treated with the strictest confidence. Caroline Law. Neighbourhood Watch Co-Ordinator. Theydon Bois Rural Preservation Society 2007 Walks: For at least the last thirty years, albeit with a few gaps, the Society has organised walks from the village to explore the surrounding countryside and forest. The Society was formed during the last war, in 1943, to try and preserve the rural aspect of the village, and the walks are one way of checking just how successful we have been. If you have moved to Theydon Bois recently, we hope you will want to get to know its surroundings and learn to walk the public footpaths through the countryside with confidence and roam the forest freely and without fear. Why nor join us on one or all of our walks this year, between April and September? Old hands will point out things of interest along the way. The walks are not too strenuous, start from the village hall at 2 pm. on Sunday afternoons, last for two hours and cover about four miles. You will need stout footwear, as the ground can be wet and/or muddy in places, and suitable clothing for the time of year. The April and July walks have stiles to be negotiated. Make a note now of the following dates – they are all the first Sunday in the month. 6th May	- Find a fort in the forest. 1st July	- A look at the newly planted Theydon Wood. 2nd September	- Circumnavigate the village boundary. * Essex and Kent were the two counties thought likely to be invaded by the French and so the army made the maps to work out where to put the guns (ordnance) in order to repel the invaders! The surveyors needed three high points to set out their initial triangle and we will visit one of them. The maps were drawn and initially kept at the Tower of London. Theydon Bois Parish Councillor Martin Oliver has obtained a place to run in this years London Marathon which takes place on 22nd April. 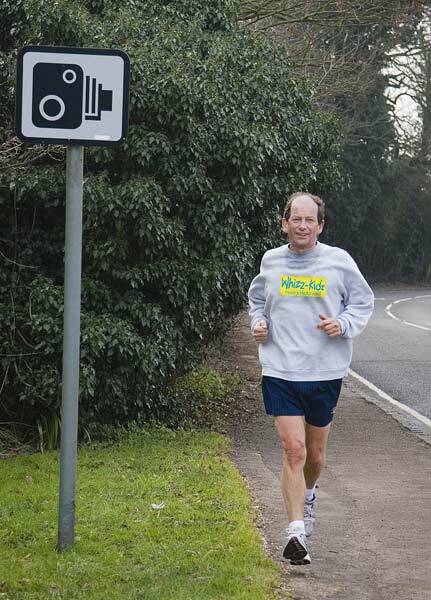 Martin is running in aid of his charity Wizz - Kids. Whizz-Kidz changes disabled children's lives - literally overnight. By providing them with customised mobility equipment, training and advice. Martin is trying to raise £1,500 in sponsorship and so far has sponsorship of over £550. If you would like to support Martin and this very worthwhile cause then why not make a donation. Sponsorship can either be by cash or cheque (payable to Whizz-Kidz). directly to Martin at 36 Woodland Way (Tel. 01992 812042) or via his secure website www.justgiving.com/martinoliver where they can be anonymous or not. WHEELIE BINS: Wheelie bins finally arrived in Theydon Bois in November with little advanced warning except for a road show at the village hall which was poorly attended possibly because of lack of advanced warning. Our general acceptance of wheeled bins which have received a mixed but generally favourable reception in Theydon Bois. Our opposition to fortnightly collections in summer months and concern over the extended period of collections over the Christmas period when clear sacks for recyclables were not available in the village. 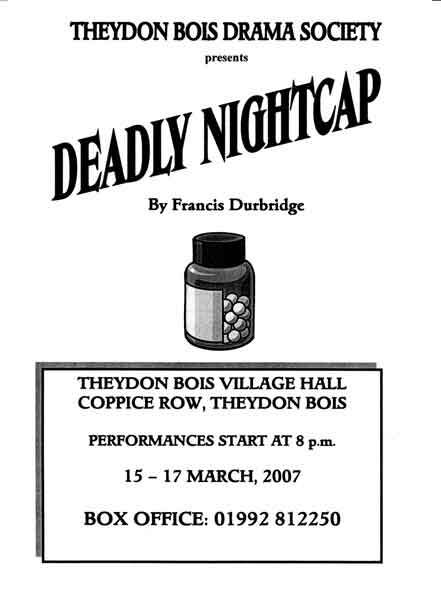 Our next drama show will be 'Deadly Nightcap' - a thriller by Francis Durbridge. Dates are Thurs 15th - Sat 17th March 2007, at Theydon Bois Village Hall, Coppice Row, Theydon Bois. "Murder and mystery abound in this thriller about a corrupt husband plotting murder, but many twists and entanglements ensue." Bits of white paper hide, when it snows. Unless you count my yield - three socks and a glove. Litter pick is at 9.00 am on the first Saturday of every month. Next 5 dates; Saturdays 3rd March, 7th April, 5th May, 2nd June, 7th July. Please add them to your diary. Gloves, sacks and grabbers are provided at the Village Hall car park. Bring the children; it will make them aware of the eyesore of dropped rubbish. In accordance with normal procedures your Parish Council has now performed its annual budget process and has set the precept for 2007-8. 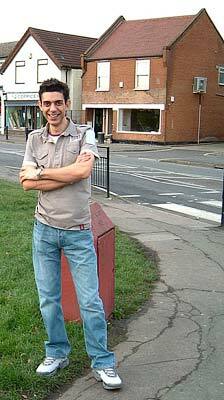 For the year 2006-7 the total precept was £60,053 which includes £34.981 repayments for the village hall. For the year 2007-8 we are proposing a precept of £61,576 an overall increase of 2.5 %. After deduction of the loan payment the total cost of your parish council is less than £10 per household. Apart from the precept the parish earns income from the cemetery and the allotments. Sponsorship virtually pays for Village News. The largest item of cost is salaries for the parish clerk, assistant and burial supervisor. The Parish Council is also responsible, inter alia, for cctv maintenance, grass cutting at the green, dog loos and makes significant donations to causes and activities relevant to our village. Parish Council business is overseen by eleven councillors who work on a purely voluntary basis and spend much of their time trying to influence district and county councils regarding planning and highway matters. Changes to the Bus Service: In his capacity as Parish Transport Representative Cllr Glozier has reported that Arriva had provided notification that the 500 service would cease to run through Abridge and Theydon Bois and would be re-routed via Ongar. Essex County Council has a duty to provide a bus service and will provide a new service into Theydon Bois, the 541, which will be an extension to the current number 10 service. The exact timetable for the new 541 service is yet to be finalised but the service will commence operating on 30th April. Cllr Glozier thanked Essex County Cllr John Spencer on behalf of the residents of the Village for his considerable efforts at County level to secure a route through Theydon Bois and commented that the end result was a good outcome for the Village insofar as, whilst the ‘no change’ services to Harlow and Romford had been lost, a ‘no change’ service to the library at Debden, to Buckhurst Hill, the Limes Medical Centre and St Margaret’s Hospital had been gained. There are outstanding issues to be resolved in relation to “through ticketing” and the evening and Sunday services, where subsidies are far in excess of agreed levels due to low levels of passenger usage. Cllr Glozier reiterated that the new 541 service is a “County Service” subsidised by Essex County Council and if it is insufficiently used then it's continuation will be reviewed at a future date. A New unisex Hairdressing Salon called Tikadi will be opening in the Village: on Friday 23rd March. On Thursday 22nd March there will be a grand opening party when drinks and nibbles will be available from 2pm through to the early evening. All villagers are welcome. Michael (pictured in front of the salon) who will run the salon will be there to welcome guests and introduce them to the team and view the facilities. All who attend will have the chance to enter a free prize draw and one lucky winner will receive £200 worth of Tikadi vouchers. During April any customer presenting a copy of this article will receive a free finish with any service over £20. This offer applies Tuesday-Friday 9-5.30. until the 27th During this period there will also be an opportunity to enter the prize draw which will be drawn on Saturday 28th April. The offer cannot be used in conjunction with any other offer or promotion. Michael and his wife Tracey are blessed with 7 year old triplets- Tiegan, Adem and Kian who influenced the name of the salon. Some twenty years ago Michael based himself in Loughton after training and working in the West End where he instantly built a strong and loyal client base, with many customers from Theydon Bois. During this time Michael had experience in seminars, shows, photo shoots, competitions and a celebrity wedding. He trained and influenced many colleagues and a number of these will form the Tikadi team. Michael believes that constant training and involvement within the industry is vital to keep up with seasonal trends and to offer the very best service to the customer. With client comfort in mind a full range of refreshments will be offered and the salon will be fully air conditioned and heated. It is hoped that there will be two late night openings to 8.00pm. The salon will offer a full range of hairdressing services, using top quality products and tools which will also be available for purchase. The latest technology in treatment and equipment will be employed. Exercise in 2007: Try walking in 2007! Walking helps protect the body from many illnesses and conditions: heart disease and stroke, high blood pressure, osteoarthritis, obesity, depression, some types of diabetes and colon cancer. Health experts agree that 30 minutes brisk walking on most days of the week is sufficient to improve fitness. That might seem a lot at first but walking can be incorporated into your everyday life more easily than any other activity. You don’t need any special gear and you can do it wherever you are. It raises your energy levels, works off calories and doesn't’t cost a bean! Where to start? Try looking at www.walkinginessex.co.uk – this website gives you all the information you need to know to start walking. It lists guided walks taking place, leaflets and books of walks and contact details for dozens of walk groups. Go on, check the site now – you know you will enjoy a good walk! Open Gardens Day 2007 : An early date for your diary. Two New Applications at Wansfell College: Villagers will remember that last year there were two planning applications for the Wansfell College site and after a long process decision after the Inquiry on appeal was that the proposed development should be refused as harmful to the Green Belt. There are now two new applications to develop the site, EPF/2470/06 is an Outline application for the erection of new dwelling on new plot 30A Piercing Hill and EPF/2464/06 is for change of use, alteration and extension of the former college building to contain 14 no. residential flats with on-site parking. (Revised application). The applications are now available to view at the EFDC Planning Office in Epping and many of the people who wrote letters with regard to the previous applications may want to consider the implications of these latest ones. Theydon Bois & District Rural Preservation Society & the Parish Council have yet to consider them, but will be against any development harmful to the openness of the Green Belt.